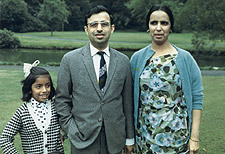 In 1965 Yash Pal Suri, a young doctor, left India for the U.K. with hopes of improving his family's life. 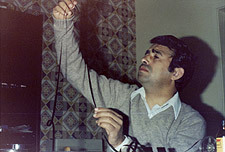 The first thing he did upon arriving in England was to buy two Super 8mm cameras, two projectors and two reel-to-reel tape recorders. He sent one of each to his family in India, and kept the others for himself. Over the next forty years, through regular mailings of his filmed and taped thoughts and observations, he shared his new life abroad with family members back home, providing a unique record of the eccentricities-and occasional racism-of his new English hosts. Back in India, his relatives, in turn, responded with their own "cine-letters," sending tales of weddings, festivals and village life, along with impassioned pleas for his return. 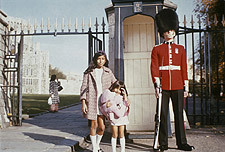 In addition to home movies, I FOR INDIA, directed by one of Suri's three daughters, uses archival and contemporary footage and excerpts from BBC TV programs (including The Dark Million, The Immigrant Doctors, and The End of the Line), which chart the changing national mood about immigration over the decades, from bemusement at the strange customs of the South Asian newcomers, to fears of British culture being "swamped," to right-wing protests demanding the expulsion of "colored" immigrants. By the end of the film, as Suri and his wife communicate today via webcam with a daughter who has relocated to Australia, I FOR INDIA becomes not only a bittersweet time capsule of cultural alienation, discovery, racism and belonging, but also a contemporary exploration of universal, emotionally compelling themes of family separation and the quest for personal happiness, wherever it may take you.